These sparkling stud earrings combine a simple design with a stylish two colour finish. A loop of silver boasts glittering cubic zirconia, interlinked with a polished circle of 9ct rose gold. A simple dash of modern glamour, ideal for all occasions. Two colour jewellery with a sparkling finish. 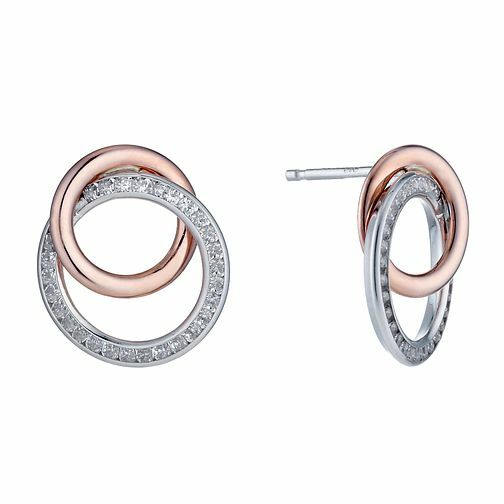 Silver & 9ct rose gold cubic zirconia circle stud earrings is rated 5.0 out of 5 by 2. Rated 5 out of 5 by Anonymous from Beautiful, tasteful & subtle Bought these earrings as a gift for a family member, they are very pretty and delicate - very sparkly yet tasteful. Not too big, suitable for all ages. Rated 5 out of 5 by Anonymous from Gorgeous! A present for my mother who absolutely loved these earrings, Fantastic quality and look gorgeous!